A.J. 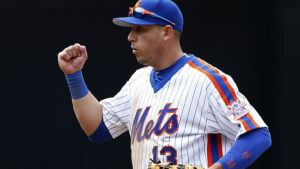 Ramos picked up his 25th save of the season Tuesday night at Citi Field that preserved a Miami Marlins 5-2 win over the New York Mets. 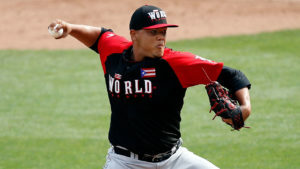 The 29-year old righthander is one of the reasons the Marlins are contending this season and keeping pace with the Mets and first place Nationals in the National League East. And while the Marlins are contending. Ramos, a three year veteran is enjoying the ride. Prior to the game he saved, a personal win was also achieved when he and three other Marlins were selected to be a part of the National League all-star roster for the annual mid-summer classic to be played in San Diego next Tuesday evening. 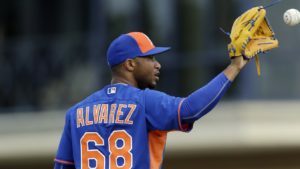 And the Marlins defense is partly responsible for Ramos, who got his latest save which is second in baseball behind Jeyrus Familia of the Mets who notched his 30th Wednesday afternoon. Ramos has been that good. There has been one blown save, last Friday against the Atlanta Braves which snapped a streak of 33 consecutive converted opportunities dating back to last September 8th facing the Milwaukee Brewers. That tied for the longest run in club history, with Steve Cishek, who had 33 in a span from June 8, 2013-to April 22 of the following season. He is an all-star. The opposing managers and players have seen the consistent fastball, curve and slider. Last season, Ramos established career highs by appearing in 71 games and recorded 32 saves. There was also that last day of the season, Ramos became the first Marlins closer to save both games of a doubleheader. “I got the call, and when I always do just go in there and do what I have to do,” he said about that one day sweep in saves. That was then, this is now. His first all-star game next week is part of that fulfillment of being in the Major Leagues. Of course, the other is a World Series ring and the Marlins may not be too far from getting there and with Ramos as their closer. Ramos is 29 years of age, still young in baseball circles. But there has been a journey to get where he is today. There was a struggle and the minor league stints before becoming a regular part of the Marlins pitching plans. And, Ramos, who attended Texas Tech University where he led the Red Raiders in strikeouts for two seasons, had to battle back from Tommy John Surgery that had many skeptical about his ability to become this elite closer. The Marlins gave him the opportunity as a third round draft selection in 2010. In other words, Ramos is not conscious of the critics, And, with the way the saves have been coming there is no reason to level any doubts of his ability. “It is well deserved for A.J. and it is good to know that he has been awarded for what he has done for us and for himself,” said Mattingly. Ramos will be in San Diego with two other pitchers from the Marlins roster, Jose Fernandez and Fernando Rodney, and with outfielder Marcell Ozuna. The first half for the Marlins has been sort of a surprise, though some baseball experts picked them as a sleeper to be a part of the postseason. They are young, and NL manager Terry Collins could have also selected three or four more deserving players from the Marlins, but the all-star game has that roster limit and more than one gets bypassed. 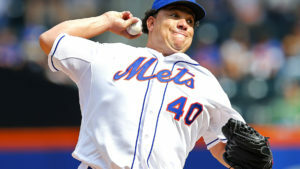 “He throws hard and his numbers speak volumes as to why he was chosen to be in San Diego,” said Collins the Mets manager. Collins was plain and simple about Ramos. Selected by an opposing manager, Collins, who may have the best closer in the game on his staff also pleased Ramos. Regardless, A, J. Ramos is a National All-Star and that’s all that matters.